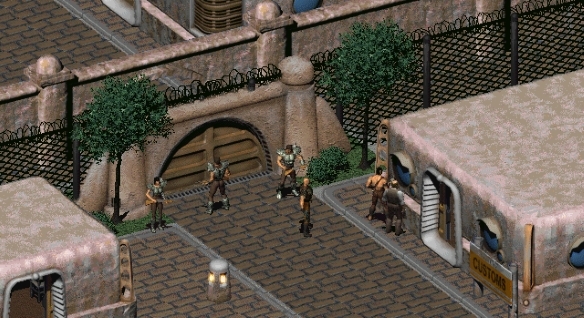 While I generally like and even prefer isometric views for my CRPGs, there is one thing that I don’t like: It’s impossible to see the faces of the characters (except in pop-ups) and really identify with them visually. 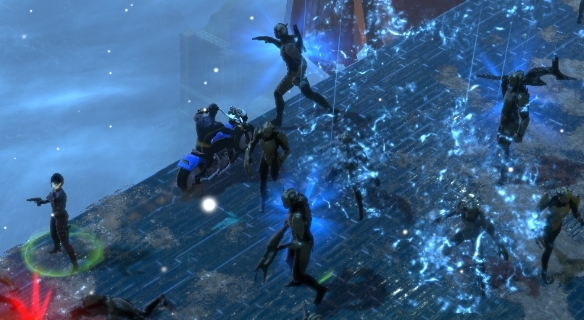 I mean in the above picture, my character (in the middle of the gate) looks exactly the same as the guard to the right because we’re wearing the same metal armor. Just ants moving around on a playfield. Anyway, with a day pass secured due to my silver tongue, we’re going to get to see inside Vault City without having to make much of a fuss. 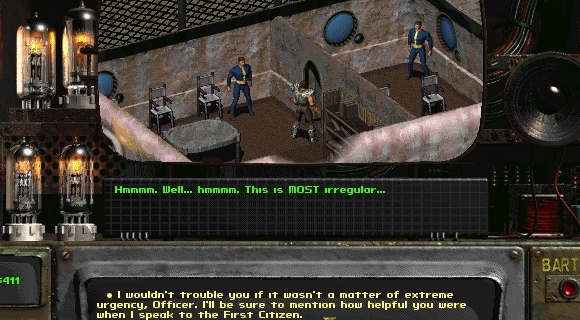 Make no mistake, the inside of Vault City is probably the single nicest location in all of Fallout 2. Everything is nice and neat and orderly. And that means, of course, that this is probably worse than anywhere else in the game. Everyone working on the landscape is cowed in fear of the Citizens, and there’s a large ominous corrections facility right in the middle. I made a beeline straight for the vault door, but the guards refuse to let any non-Citizen through it. Shucks. I’m half-tempted to open fire. Instead, I head to the pharmacy and buy some Rad-Away, then bring it back to the sick fella and cure him of radiation poisoning. It gets me just 100 XP (for around $780 spent on the cure), but that’s enough to push me over the next level! Back in Vault City, a routine search of the maintenance center turns up more than we’d expected: Vic’s daughter, Valerie. And BOY is she ticked at Vic for being away so long. In an in-game scripted moment, the two of them bicker back and forth, establishing that Val’s mom is dead and Vic ain’t so good at repairing stuff. I love that my character actually gets his own lines, eventually telling them to shut it. So here’s a good tip for those playing: Don’t touch Val’s bookshelf right there. If you do, she — and the guards — turn hostile against you. In a neat touch, so does Vic, because family sticks together. I’m not so much the murdering type. The stealing type, now yes I am. Val’s back room has a half-dozen locked lockers, which gives me ample practice for my lockpicking skills. Four minutes, 200 XP, and tons of great loot later, and I walk out whistling. While there’s no doubt that Carbine would have liked to have made yesterday’s free-to-play announcement without the previous weeks’ spoilers of said announcement, those leaks had one benefit that I can see: They seemed to shatter the delusions of the anti-F2P brigade and allowed the real announcement to be mostly free of vocal grousing. Mostly. 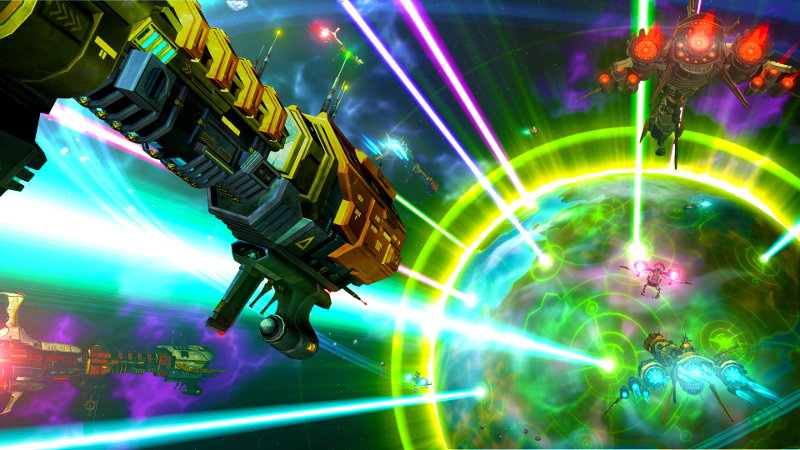 In other words, it was a really positive day in the WildStar corner of the community, and boy have we needed that. It’s a game that deserves a second chance and some room for growth, and it might actually get just that if it can harness this newfound community interest and keep it going until the F2P transition comes this fall. Other than having to wait several months for this — and the next big patch — to happen, there’s nothing that disappoints me here. From the looks of it, the plan is well-laid-out, generous to a fault, and hopefully will lower the entry barrier enough to draw in all of the people who were turned away by the monthly sub. (1) I love that there’s some consideration for people who bought the box (as in everyone playing the game right now or who purchased it in the past). Extra character slots, costume slots, bank slots, loyalty points, and a higher decor limit are all very nice bonuses — or compensation, if that’s how you want to look at it. Hey, I won’t complain at having a couple more costume slots, no sirree. Then there’s the incentive to sub up right now and/or stay subscribed until the transition: a pet, a housing DJ, a music track, and additional months of “signature” service (XP bonuses and the like) after F2P goes live. Since I’m planning to stay subbed up anyway, those are just freebies. (2) No content restriction. Coming from SWTOR’s restrictions on endgame activities and races, this was really nice to see and have them emphasize. (3) It’s good to see that some of the social/services restrictions (or limitations, however you want to look at it) can be removed or lessed by spending loyalty points. Looking over the list, I don’t see any restriction that would be truly oppressive for any F2P newbie. (4) The FAQ mentions “holiday event” currency acquisition, which means that there are actually plans to get holidays up and active in the game. There was also a mention of possible expansion packs. Huzzah for that! Of course, to temper my excitement, I have to admit that we won’t know the full picture until Carbine releases all of the info on what it will be selling in the cash shop. The studio indicated that players will be able to find most of the same offerings in-game and that it doesn’t want to sell power or other “pay to win” advantages, but again, we won’t know until we fully see the list. There’s also some bruised feelings from fans who won’t be getting the special loyalty mount for being subscribed constantly since launch. Hey, I took a break and won’t be getting the mount, and oh well. Life goes on and it’s not that important. Hoverboards > everything else, after all. The whole announcement has me excited enough to consider working on my lowbie Esper, since I now feel more in it for the long haul than ever. It’s going to be a long — but exciting — summer. Cyclops? Kind of growing on me. I’m not big on his “perfect teacher” persona, but I can’t deny that he’s more than just a boring pew-pew machine. His richochet blast is a good basic power, his “Visor Off!” is a visually stunning signature on a one-minute timer, and the guy gets his own motorcycle that costs zero spirit to use. Seriously, I am in love with his ride. Anyway, I promised to share my Marvel Heroes notes that I’ve been taking over the past couple of weeks with all of you. These are mostly just for me and aren’t comprehensive, but instead help me suss out parts of the game that I previously didn’t fully understand. If they help you guys too, then why not put them up? Story mode is important but slow leveling. you get power points, permanent stat increases, useful buffs. Do three times, one for each difficulty level. Welcome to Vault City! This is a jarring shift to what we’ve seen in the game so far; Vault City is “pristine” with nice streets, a greeting office, razor wire, automated turrets, guards, and what looks like an outdoor holding cell. So I’m guessing that its good looks come at the expense of freedom. We shall see. Curiously, no one is actually inside the greeting office. So I decide to greet myself by lockpicking the desk and lockers and grabbing the goodies within (including a geiger counter!). A lady is crying in a tent nearby, and after hearing her literal sob story, I get a better picture of what Vault City is about. It purports to be a free town, but it locks up its people for just about any offense, lives on a slave system, and bows to the omnipresent guards. Gonna have to fix this, I see. And get her her husband back. In a shack, I bump into Ed — the guy who sold Vic the Vault 13 water flask. I interrogate Ed about its origins, but receive a list of a half-dozen potential towns as answer. However, Ed does mention that Vault City sits on a vault and that its computer might tell me where Vault 13 is. I guess I’ll stick around then! I pick up a couple of other quests — to get radiation medicine for a sick guy, a plow for a farming family — and then head into the bar. In a stroke of luck, the bartender Cassidy is extremely disgruntled with the higher-ups of Vault City and totally willing to leave his job to join my crew. Despite his admission of a bad heart condition, I’m scarcely going to turn down another party member. We swap weapons, so I have his sawed-off shotgun and he gets my trusty pistol. Let’s do this! I find the local trader and procure a plow for the farmers (for a whopping $800, ouch). After that, I go on a bit of a shopping spree, picking up metal armor and a ton of ammo in exchange for the random goods I’ve been hauling around. This is great; now I have a shotgun as a primary weapon and a Desert Eagle as a backup. Sulik is going to stick with the sledgehammer, while Vic gets my old leather armor and half the pistol ammo and Cassidy gets the other half. I feel like I’m finally in charge of a fighting force. Of course, it’s going to take a lot to keep this unit rolling in ammo, but that’s a problem for another day. Actually, where I was at before wasn’t Vault City proper, but merely its courtyard. To get into the real place, I’m going to need citizenship papers or a day pass. I strut into the customs office and deal with a toadie wearing the iconic vault jumpsuit. He’s willing to sell me forged papers for $200, but I think I have a better idea. I talk to his boss and use my awesome speech skill to run circles around him, eventually netting me a free day pass. Some juicy info on the future of The Secret World on the official forums today as we begin our undoubtedly long, long wait for the next adventure zone. If we can’t progress the story, then giving us other objectives is a good second, I suppose. Here are my thoughts on the revelations, all of which will be coming to the game *next week. * I am so stoked. I don’t run dungeons as much as I used to, and even if I did, the Orochi boss fight wasn’t a thrill-a-second experience that I’d want to be doing it on an even harder mode. Thanks but pass. Up until now, The Secret World has not had mounts (apart from a single snowmobiling mission), but that looks to change soon. Funcom’s actually going to be giving us a choice of staying on foot with added visual flair or using a mount overlay (although all of the speed boosts will remain the same). Then there will be show-off mounts and two more ranks of speed boosts (up to 150%). I am *all* for getting around these zones more quickly and in style, so this is definitely a big addition to the game. We haven’t heard about any specific vehicles, other than the motorcycle and what is hinted at being a Back to the Future II-style hoverboard (yay hoverboard! ), but that’s a good start at least. The devs promise that vehicles will be just as responsive as running (in terms of turning and strafing, I presume), so they really are just an overlay. Whenever this arrives, Funcom will be selling a $20 pack that comes with a new mission to get a motorcycle from Moose, a nitro boost, and sprint VI. Sure, I’ll pony up for that. I’d love for it to be account-wise like the mission packs, please. Anyway, this is just terrific stuff. The surprise of the announcement (at least to me), there will be a special vendor who will offer rewards based on the number of achievement points. Up until now, I’ve ignored achievements because apart from a select few tied to specific rewards, they were mostly empty numbers. Now those numbers have a purpose, so I might have to go back through the game and start collecting them (depending on how good these rewards are, of course). When giant robot corpses litter the landscape, perhaps it’s time to question why you want to colonize a planet that’s killed them. Just a thought. 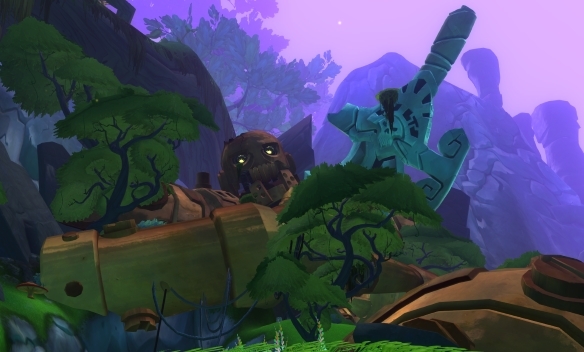 Last night I put my final touches on exploring and questing through Wilderrun in WildStar. It’s been a long trip through it, although not an entirely unpleasant one. I fully expected to be annoyed by the jungley biome, but apart from the lack of several taxi paths, it was actually quite fun to traverse and especially explore. I don’t think any in-game mount is going to top scooting around on WildStar’s hoverboard, especially when I launch off a high point and do that double-kick move in mid-air. I haven’t felt particularly rushed to get through this zone, either. I think I’m at 42 or 43, so level 50 is definitely in sight, but the endgame for me will probably be doing contracts, working on my house, and maybe doing dailies while I ponder an alt — so no hurry to get there. Actually, with the last big patch’s change to challenges, I’ve kind of gotten hooked on doing those. There were a few spots in Wilderrun where I’d come across two or three good challenges in an area with desirable rewards, so I’d just hang around there, do those, and grind mobs while I waited for the timer on them to reset. And that, boys and girls, is the story of how Syp got a fish pump for his zen pond. I do kind of wish I had been faithful in leveling up my cooking skill, which still sits at 1. Most fights I come out pretty OK, with my bots and shields taking most of the damage, but once in a while I’ll get thumped and then have to watch my health slowly regenerate. Sure, I could buy food from the vendors, but it’s kind of expensive and I’m a penny-pincher in this game. There is SO MUCH to spend money on in WildStar: Housing items, outfit dyes, resurrecting on the spot, etc. I don’t think I’ll ever have enough plat to get a single CREDD — at least not any time soon. Maybe if I ever do level up my Esper, I’ll focus more on crafting and cooking with her. I’ve always meant to get back to being an architect and designing a truly awesome housing plot, instead of a ramshackle collection of the junk I’ve found. One other thing I’ve been doing is working on tweaking a nice shotgun build. I really like what I have now, but sometimes I want a more mobile fighting style that uses bolt caster to great effect. Let me tell you, I’ve fallen in love with the repairbot as one of my two (assaultbot is usually my other). It not only does a bit of nice damage, but its constant shield regen on me is a literal lifesaver.